Publication date: 2 September 2005. I am planning to develop a new product using magnets. I only know the very basics of magnets, so would like to ask a few simple questions. My magnets would only need to hold about 100-200lbs maximum. The thing is I need them to be quite small - no larger than 5 by 5cm wide, and as thin as I could get. Fridge magnet thinness would be the ultimate. Is this realistic? Can there be a gap (say an inch) of rubber between them and will they still hold 100-200lbs? I also need them to be reasonably tough. Chances are they will get knocked around. Waterproof would also be good. I gather rare earth magnets are quite brittle - can they be made more robust? And I would need to have an engaging mechanism that will disengage them easily and very quickly - like an on/off switch. Is this possible? And if so, would it need power? And finally, how long would the magnetism last? I think it'd be physically possible for rare earth magnets close to your specs to hold the weight you need, but single solid magnets like that would be very hard to work with. Ceramic magnets of all kinds are, as you say, brittle; one 50 by 50 by 3mm (say) would be very easy to snap. You could, however, use an array of smaller magnets. I suggest you hit eBay and buy yourself a bunch of little NIB magnets - you can buy coin-sized magnets quite cheaply in bulk - and fiddle around with them to see how they suit your needs. I doubt you'd manage it with an inch of rubber, but a centimetre might be doable, if we're talking magnets on both sides of the rubber and the rubber's allowed to compress. Epoxy coating's the most common way to make ceramic magnets tougher. Of course, the thicker the coating, the further away you are from the peak magnetic strength. But I'm sure you could sandwich magnets up in, say, a titanium envelope, or a Kevlar/carbon fibre wrap, and end up with a quite tough product. Once again, a bunch of smaller magnets would be far easier to armour than one big one the shape of five stacked playing cards. Permanent magnets like this one have a lever-release mechanism. It works because the magnets are inside a field-guiding steel channel; operate the lever and the magnets are retracted further into the channel, reducing the pull enough that you can yank the assembly free. Some of these arrangements do feel quite a lot like an on-off switch. Ceramic magnets' magnetism will last forever, or until the magnets get heated past their Curie temperature (only about 310 degrees C for NIB magnets), whichever is the sooner. Old-fashioned alnico magnets need to have a "keeper" on them all the time, or they'll slowly demagnetise. Ceramic magnets of all kinds (plain ferrites, samarium cobalt, NIB) don't have this limitation. I am looking for a magnet to remove foreign objects buried under he skin, like BBs. I was looking for an electronic magnet but maybe permanent magnets will work? What do you think? It depends how deep the object is, but BBs from an air gun (I'm presuming that's how they're getting in there...) won't penetrate far, and are big and smooth enough that a magnet will be able to move them. I wouldn't be surprised if a mid-sized rare earth magnet worked well for moving them to an exit point with less trauma than would be caused by forceps. Of course, this'll only work with steel BBs - but I think that's the only kind of BB gun ammo out there, not counting lead pellets, which of course aren't magnetic. "Copper" BBs are just plated steel. Airsoft pellets are plastic (the super-heavy sniper balls have a shiny coating that might be steel), but I doubt any Airsoft gun has the power to plant them through the skin. A permanent magnet might be some use for removing steel splinters from the body, as well - the kind of little bits that commonly end up stuck in the hands of metalworkers. They tend to hang onto the flesh pretty well, though, and if they've been there for any length of time there'll be scar tissue holding them in place. Magnets have apparently been used to remove suitable foreign bodies from people's eyes for a long time; there, there's less for the metal to hang onto. You shouldn't have iron in your eyes in the first place, of course, but if you do, remember to sell the removal video to David Cronenberg. I don't know much about LEDs except for what I've read on your site, as well as others. I ordered some LEDs (1W high power – 3.2-4.0 volt, 300mA, 35 lumens) and I want to find the appropriate resistor for attaching them to my 13.8 volt source (motorcycle). So I know I need a resistor with around 34.33 ohms… but I also read that I needed to find out the wattage. Doing this by multiplying the 10.3 volts by 0.3 = 3.09 watts. A 3.09 watt, 34.33 ohm resistor? I looked online at Radio Shack and their resistors are mostly 1/4 and 1/2 watt. Do I need to find a 3 watt resistor? Your calculations are correct, assuming the LED specs are accurate. The nearest standard resistor value is 33 ohms. What you want is a power resistor - a 5W unit won't be very big, but should be fine with this much current without special cooling (it'll get warm, though). 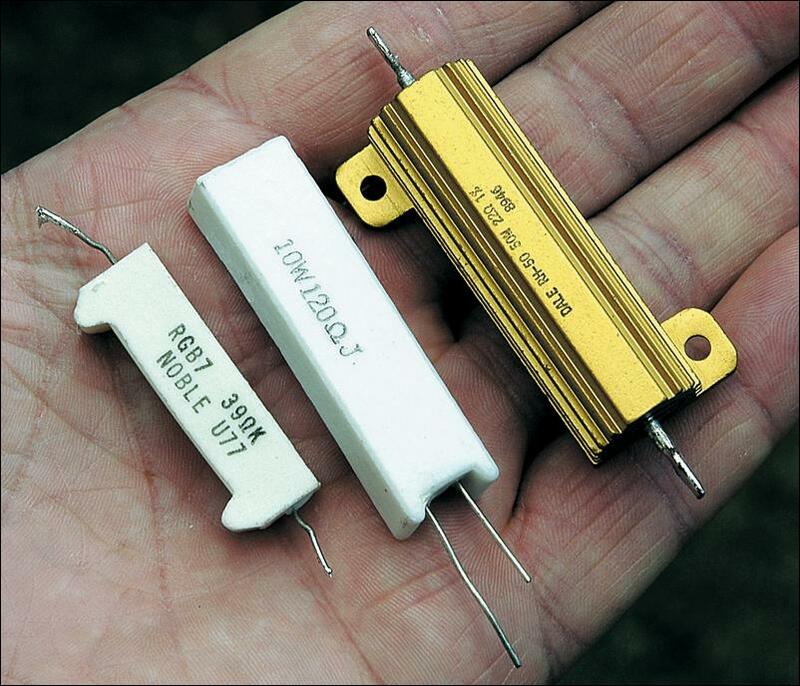 Here are some examples of power resistors; the right hand column on this old page has another one. You only need one of the plain ceramic models, but if you buy a higher rated resistor with an aluminium heat sink, you'll be able to screw it onto things more easily. Small power resistors are cheap, and ordinary electronics stores commonly stock them. The bigger ones with heat sinks aren't very expensive either, but they can be harder to find. Any half-decent electronics store should be able to point you to a stockist, though. Note that if you string more than one LED together in series (thereby adding their rated voltages; two 3.5 volt 300mA LEDs in series behave like one 7V 300mA LED), you'll need a lower-rated resistor, and waste less power as heat (the one-LED arrangement you're considering throws away three quarters of its energy). The down side is less protection against thermal runaway, but in this situation I wouldn't be worried at all about using series strings of two LEDs. This thing has been bugging me for years. It's a simple question and most probably won't pass any ROI calculations. Why would a pedestal fan (or any other kind with a similar motor) have a problem starting up? You know when one turns it on, presses speed 1, 2 or 3, the fan turns really slowly but does end up rotating at its set speed after a few moments. But the next time one uses the fan, it springs into life immediately (as it should) and so forth; it may or may not do that the next time round. A pedestal fan will cost me only about $AU40, so it's not going to break the bank (in fact I've bought a few replacements in the past), but I don't really want one to meet the big pedestal fan in the sky without this knowledge. I've had a look on the Web but could not find any info on this - but did find related info like direct drive electric motor, induction motor and capacitor problems. And if I knew what these terms means, I most probably won't be asking the question. Cheap desk and pedestal fan motors don't have a lot of low speed torque (I think cheap fans all use shaded pole motors), so if the shaft bearings get sticky, the fan doesn't start well. These cheap fans (heck, probably expensive ones too) all use sintered bronze bearings, like the bearings in cheap computer fans. The bearings are impregnated with lubricant at the factory, but they get gunked up (a technical term) over the first few zillion rotations, particularly seeing as the fan pulls air through itself to keep its motor cool. Dust comes with that air, and it doesn't just cake up on the impeller and the cage around it. Leave the fan off for a while and the cooling gunk makes the bearings sticky; that, along with the considerable mass of the fan impeller, means the motor has trouble kicking over. Many old fans will start OK if you ask for full speed, but not if you press the low speed button first; extreme cases won't kick over at any speed unless you poke them with a pencil or something. Once the fan starts rotating, the guck has stopped sticking and started slipping - a phenomenon familiar to anyone who's had to loosen a stuck screw. The motor probably also develops more torque once it's turning - if it was a simple brushed motor it'd develop maximum torque at zero RPM, but it isn't. That's actually a good thing - super-torque from stuck brushed motors is really good at stripping gears and blowing fuses when something's really solidly mechanically jammed. Once the fan's been running for a while, the bearings will have warmed up and some of the semi-lubricating guck in there will have liquefied, so it'll be easy to re-start. There may also be a thermal expansion issue, but I doubt it outweighs all of the simple dust and hair that accumulates in there. Feel free to take the fan apart and drip a bit of oil down the shaft. If you just take the impeller and cage off, the fan should still be perfectly electrically safe, so you can leave it plugged in and blip the power buttons to spin the shaft and encourage the oil to penetrate. You can even take the whole cowling off the motor (after unplugging the fan, this time...), but you won't necessarily be able to reach the back bearing that way. Dismantling the whole motor is worthwhile only if you're really keen to see how they work. Commonly, the very cheesiest of discount-store fans will work pretty much indefinitely, with no maintenance at all (though it may reach the push-it-to-start-it stage after a few years). Even its hokey plastic-geared oscillator arrangement will probably last forever. Fans, refrigerator compressors and microwave magnetrons are excellent examples of highly refined dirt cheap technology. I had a $200 Pulsar watch which bit the dust when I fell off my pushbike. So while searching for army watches on eBay (I wanted a tougher watch) I found these. The one I want is here. It's the type you don't have to wind every day. I basically want to know if there any good, and why do they have "jewels"? Are they real? Why so many - some have 31! Why do you have to wind some and not others ? And most of all, will they survive a fall off a pushbike? P.S. these watches are extremely cheap at under $50. Is this deal too good to be true? The general consensus seems to be that these Russian watches can be excellent deals, but quality control is lousy. "Poljot" is another popular brand; they've got some brilliant looking watches for far less than you'd pay for a technically similar Western European timepiece. The fancier ones are up around the $US200 mark; the basic models are down around $US50. The catch is that it's apparently a crapshoot whether you'll get one that works right or not. Plain old lousy timekeeping is the usual problem, not that you necessarily care; a lousy watch that gains or loses a minute a day can just be re-synced whenever you've got a spare moment in front of your computer. But poorly lubricated or otherwise screwed up Russian movements may also just plain stop after not very long. Some of the problems these watches have can be fixed by a watchmaker (who may charge you more than the watch cost you...); some can't. Many people still regard the Russian watches as a bargain (especially compared with some alternatives), but only compared with the outrageous prices charged for big-brand mechanical watches. All of these things are very much obsolete technology these days, after all - remember, a mechanical Jaeger-LeCoultre that appears to have been made by elves and costs as much as a car still won't keep time nearly as well as a $10 quartz watch. Russian watches are like Russian camera lenses; to some extent, you get what you pay for. I'm perfectly happy with my all-manual $US200 Russian Peleng fisheye lens, since it cost me a third of the price of an auto lens with the same specs; it isn't nearly as good optically, but the price was right. The jewels in a mechanical watch movement aren't decorations. They're ruby (or possibly sapphire) bearings for the moving parts. The faster a part moves and the more stress there is on it, the more quickly it'll wear away if its bearings are made of metal. Ruby bearings last practically forever in a watch movement. Synthetic rubies (chemically identical to super-expensive "real" ones) are extremely cheap these days, so the raw bearing materials for an umpteen-jewel watch movement cost close to nothing. The basic jewel count for a modern mechanical watch is 17; watches with more jewels probably use the extras to support extra gizmoes like automatic winding, extra hands, alarm functions, and so on. "Automatic" mechanical watches usually have a little weighted disc in there that spins as the watch is moved, and winds up the spring. "Manual" watches lack this feature, and have to be wound by hand. Note that you can get battery-free automatic quartz watches these days, too; Seiko's Kinetic and Citizen's Eco-Drive, for instance. Here's more about mechanical watches in general. Will such a watch survive a road impact? Probably not - and assuming you get a nicely working one, it'd be a shame to smash the poor thing onto the ground anyway. If I were you, I'd just buy a cheap quartz sports watch and resign myself to spending another $15 any time I happened to manage to beat it to death. You don't have to get something that'll make you look like a 15 year old extreme sports dork, either. When you live in a cold place like Tasmania, the hot water takes a while to get to the tap when you turn it on. Have you noticed how, when you first turn on the tap, while the water is still cold, the water comes out quite fast. However, when the water coming out of the tap starts to warm up, the rate of flow slows down. Sometimes this is so drastic that one has to pause the hand-washing process to turn the tap on more (which can be very annoying if you have soapy hands at the time). Why does this happen? What is the scientific reason? I asked my Engineering Maths teacher this question a few years ago when I was at TAFE, but he seemed ignorant of the phenomenon, and thought it was a figment of my imagination. One also sometimes notices that as the water heats up, a whining noise ensues, which changes pitch with the change in temperature of the water that is coming out of the tap. What is the explanation for this? The tolerances inside a normal tap are surprisingly small; look how little the top of the tap screws out when you turn it on. The water pressure's high enough (provided you don't have a crummy gravity feed hot water system), though, that you can get respectable flow from only a small valve opening. It's that small opening that explains the hot-water-slowing-to-a-trickle behaviour. The valve gap is small enough that if the valve washer expands significantly, it shuts off the water flow. Plain rubber washers do exactly that. They "take a set" when the tap's turned off, then expand over time when you've turned the tap on and they're not being pressed against the valve seat any more. Both hot and cold tap valves do this, but it's much more noticeable with hot, because the hot water softens the rubber and causes it to expand more quickly (it's not thermal expansion, just softer rubber). The harder you turn the tap off, the more compressed the washer will be and the more dramatically it'll spring back. If you use tap washers that're less compressible - fibre washers, or any of the various synthetic washers out there that're each claimed to be more miraculous than the last - the problem won't happen. I now know to buy something other than rubber washers when I next replace the ones in my shower. The water-whistle itself is the result of cavitation - the water pressure falls as it passes through the throat of the valve, and little vapour bubbles appear, then make a noise as they collapse. Hot water, being closer to boiling in the first place, is more prone to cavitation; the changing valve thickness (and possibly also flow rate changes caused by the cavitation itself) causes the changing whistle note. I noticed in one of your old articles you mentioned using an ultrasonic cleaner, so I assume you have one. I am thinking of buying a smallish one to use on CDs and DVDs so I don't have to ever actually touch the things (and thereby avoid the inherent problems that go with that), and possibly also on spectacles, watches and jewellery. I've noticed that medical-grade ultrasonic cleaners can be prohibitively expensive, but reasonable looking units can be had on eBay for much more palatable amounts of hard-earned. What are your thoughts on ultrasonic cleaners? Is there something I'm missing that will make baby Jesus cry if I buy one? Or am I truly on the path to scratch-free cleaning salvation at last? Coincidentally, I am at this very moment listening to mine blast crud out of the crevices of a beat-up, but rare and interesting, Swiss Army knife that I bought, along with a bag of lesser knives, for $US0.99. Ultrasonic cleaning for 120mm optical discs, though, is overkill. All you need to clean them is a damp tissue - dampened with alcohol, by preference, but "alcohol" includes "meths" and "gin" as well as fancier stuff like isopropyl, so that's no big deal. Wipe from the hub to the rim, not round and round, and you'll be fine (note this column if you do manage to scratch a disc). The other reason to not bother with ultrasonic cleaning for 120mm discs is that they won't fit in cheap ultrasonic cleaners, like mine. The tub in those is always something like 170 by 95mm in area, so to clean a CD in one you'd need to dip one side of it in and then the other, and you might never quite manage to clean all the way to the hub. You can get much bigger cleaners, up to and including versions large enough for whole engine blocks, but they're proportionally more expensive. The going rate for the standard "glasses-sized" cleaners has been about $AU100 for years now (here's one; note also this thing, about which I know nothing). The bottom line: Yes, the cheap ones work, and are worth owning. They're safe to use on anything that'll survive immersion in water with some dishwashing detergent in it, and they make that innocuous solution do the cleaning job of much harsher solvents.